This super easy recipe makes four deliciously chocolatey cupcakes! Choose between Peanut Butter or Cream Cheese Frosting [recipes below] for a super sweet finish to this tasty treat! Line a muffin tin with 4 parchment paper liners, or spritz regular paper cupcake liners with oil to prevent sticking. Set aside. Combine flour, sugar, dark chocolate cocoa powder, baking soda, and salt in a bowl. Bring milk to room temperature, then combine with oil and vanilla. Pour the wet mixture into the center of your flour mixture and stir clockwise with a fork until just incorporated. Over-mixing can sabotage the batter. Next pour mixture evenly into your paper liners and set the muffin tin atop an aluminum baking sheet. This trick prevent's the bottoms of the cupcakes from getting crispy. Bake on the center rack at 350 F for approx. 20 minutes depending on oven. Adjustments will be needed for high elevations. Cupcakes are done when an inserted toothpick comes out clean from the center. Remove from muffin tin and allow to cool completely before frosting. frosting instructions: Combine ingredients and mix with a hand blender on medium until fluffy. To adjust thickness/consistency, add extra powdered sugar to thicken, or extra milk to thin. Fight the urge to spoon into your face and use a piping bag to swirl atop cupcakes. Adapted from The Comfort of Cooking. In my book "cupcakes for two" automatically means four cupcakes. I know, I know! It's partially because I like having one for breakfast the next morning [it's a thing!] and partially because Paul will eat three if I turn my back. 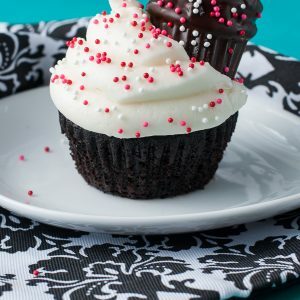 Check out Georgia's blog for proper measurements for dos cupcakes.I've been using [this] ridiculously awesome piping tool for my cupcakes and holy cow I'm in love!